What did the original Lutheran reformers say about the nature of Communion? “1. We believe, teach, and confess that in the Holy Supper the body and blood of Christ are truly and essentially present, truly distributed and received with the bread and wine. Everything that the Lutheran tradition teaches about Communion is based on this fundamental truth, which is why I have repeated it so clearly. “What is the benefit of such eating and drinking? Answer: The words ‘given for you’ and ‘shed for you for the forgiveness of sins’ show us that forgiveness of sin, life, and salvation are given to us in the sacrament through these words, because where there is forgiveness of sin, there is also life and salvation. The arguments in the Book of Concord all take this fact for granted–the arguments that it presents to support this teaching are based on the fact that in Communion, Jesus Christ is fully present (see above). Because Christ is present, so is forgiveness. It does not seem to concern itself with why or how Christ’s body and blood effect forgiveness, only that Christ’s presence is necessary for it. How is Communion distributed, and why? It should be noted that much of what Lutheran theologians argued against in the Roman Catholic church were abuses. As a result, the arguments can only be understood properly in that context. Lutherans today consistently hold that Christ is truly and fully present in each kind. What Luther himself argued against (he wrote the Smalcald Articles himself, which is why they are so “colorful”) was the teaching that, since Christ is present in each kind fully, only one kind should be given to the laity. A good teaching had been warped to create an abuse, and the best way to get rid of the abuse was to challenge and reform the teaching. Later theologians clarified this (while simultaneously asserting that Luther’s mouth was not “Word of God”, and that one person’s interpretation is not over the community’s). Luther observed that many among the laity were choosing not to receive communion, either because they were afraid of taking it unworthily, or its opposite, that they felt they didn’t have to. Frequent distribution was a problem during the Reformation and in the recent past, but for different reasons, as will be seen. “We believe, teach, and confess that there is only one kind of unworthy guest, those who do not believe… We believe, teach, and confess that no genuine believers–no matter how weak–as long as they retain a living faith, receive the Holy Supper as condemnation. For Christ instituted this supper particularly for Christians who are weak in the faith but repentant, to comfort them and to strengthen their weak faith. The writers of the Formula were not writing at a time when there was widespread division between a multitude of denomiations, churches, and sects. Though the separation between the Evangelicals and the Roman Catholic Church had occured, the vision is still of one body of believers. Nevertheless, the Formula helped shape the modern Lutheran approach to Eucharistic hospitality, which I shall discuss later. What “makes” Communion? From where does its power come? For the Lutheran theologians, the sacrament was not the source of forgiveness, life, and salvation. The sacrament, like all sacraments, was a way through which forgiveness, life, and salvation came. Communion has no power on its own. Out of context, this sounds like an invitation to do whatever one wishes with the sacrament. This is not so. This is instead an introductory statement, which is later clarified, to emphasize that the power and validity of the sacrament is not in human hands or even in the doing of the sacrament. The power of the sacrament is with God. This is why Lutherans do not generally reserve the sacramental elements. A reserved sacrament is not being used in accordance with God’s command. The exception to this is when the consecrated sacrament is being sent to those who could not physically join the community, as it is being explicitly and quickly used for its intended purpose. All citations from Robert Kolb and Timothy J. Wengert, eds. The Book of Concord: The Confessions of the Evangelical Lutheran Church. Minneapolis: Fortress Press, 2000. Posted on 5 October 2013 23 May 2015 by Pastor KenPosted in Church, TheologyTagged Augsburg Confession, Book of Concord, communion, Eucharist, Formula of Concord, Lord's Supper, Lutheran, Smalcald Articles. A very good and informative piece, and thank you very much for the time and effort and clarity that went into it. The more I learn about Lutheran theology — and about the Reformation itself, especially its early years — the more frustrated I get. As you acknowledge, many (if not most) of the things Luther and others were reacting against were acknowledged abuses in the Catholic Church. Change and reform take time. If Luther had been more patient, more willing to voice his concerns without denouncng the pope as the Antichrist, I’m not sure we would have such a consequential schism on our hands. Instead he opened the door for anybody who had a beef with anything in the Church — some of them not very stable (and I’m not sure Luther was the stablest individual) — to break with the Catholic Church or even from the churches that had already broken. It seems to me that so many of the doctrines and the complaints that started out as well-meaning with the generation that first proposed them, became with later traditions something ugly and a great loss to tradition and piety. This attack on the Eucharist being venerated even outside the Mass is a prime example. All the Elements that are adored have already been consecrated in Mass, of course. 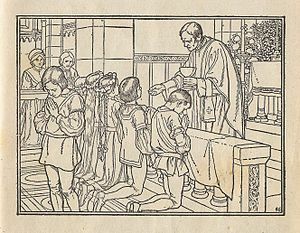 If we hold that even after Mass the consecrated Host remains the Body and Blood of Christ — and you must hold that if you propose to be able to take it to sick, to which the earliest tradition attests — then we don’t have any choice but to venerate it as the Body and Blood of our Lord. It’s contradictory to hold that after the liturgy it is no longer the Body and Blood — unless we’re taking it to the sick, in which case it still is. Reform does take time. But, Rome was not willing to do so. John Wycliffe and Jan Hus, when they attempted to convince the Church to reform, were declared heretics: Wycliffe’s body was exhumed and Hus was burned at the stake. Their reforms were ignored. The Council of Constance, which managed to end the Western Schism, failed to reform the grievous corruption in some of the Church’s practices. Erasmus is a notable exception–though he called for reform, he did so in a way that didn’t earn the anger of the Church; but, his calls for reform were ignored as well. It is clear that reform would not take place through the Pope or the Councils, since they never considered the attempts at reform valid; and even when they did, they were unable to do anything about them. Unfortunately, I think the time was right for something major to happen. The time of the Reformation was a turning point in history on multiple levels–political, societal, cultural, and religious factors all contributed to its occurence and spread. That Luther, Calvin, and Zwingli all sought strong reform independently of each other during this time is indicative of the need for reform and the conditions which allowed it to happen. Luther was given the same treatment as those who earlier attempted reforms: recant, or be excommunicated (and then killed). He was immediately ordered to be silenced when his theses and letter were received. I have little doubt that, if Luther and other reformers had stood down, the Church would have paid no more attention to reform. And then, maybe a few years later, maybe a few decades later, the situation would have erupted again. Luther was the first one that stood up and would not retract his teachings. But if he hadn’t, someone else would have. There would have been no reform in the Church if someone hadn’t. Wycliffe and Hus were both rabble-rousers who, rather than dealing with the Church, cultivated heresy in their own universities and backyards and gathered their followers for their own movements. And that’s what makes heresy dangerous — that it threatens to lead away great masses of people into error. And that’s why those people were persecuted. Your account makes it sound as if they were declared heretics from the moment they raised their voices against the status quo — but no. Hus’s teachings were first condemned by his own university in 1403 — only by Rome in 1407. He was warned to correct his errors, but he ignored these calls and even increased his attacks upon the papacy and the Church. It was only in 1412 that he was excommunicated — and yet his attacks only increased in virulence. Finally at Constance in 1415, he obstinately stood before the Council Fathers and refused to cooperate, and consequently was convicted of heresy. All of this took place at a particularly precarious time in the Church ecclesiastically and in Europe politically, in the midst of the Western Schism, under the threat of the unity of the Church disintegrating entirely and of all of Europe erupting into war. Hus was by no means a benign and innocent reformer, but a defiant, aggravating instigator of rebellion and discontent, attacking the Church where she hurt the most at the very time when she could afford it least. Even with Hus’s death, Bohemia was embroiled in useless civil wars for the next several decades. Is this kind of “reform” the Church needed? Likewise for Wycliffe — who, despite his attacks, was never condemned as a heretic or even defrocked during his lifetime. It was only at Constance that he was condemned, largely as a result of the controversy Hus had created following upon Wycliffe’s doctrines. Digging up a dead body and posthumously convicting a deceased individual of heresy is a completely symbolic gesture, and not the grave persecution Protestants pretend it was. Overall, these incidents exhibit a great deal of patience and forbearance — not the bloodthirsty and recalcitrant Church Protestants love to portray. The time was right for something major to happen — but what happened was instigated by an ill-tempered and impatient cleric who once again, stirred controversy in his own university, and to the pope’s patient queries, responded with attacks. He was not “immediately ordered to be silenced when his theses were received.” It was only three years after the theses that he received official papal censure or calls that he recant or be excommunicated. By working with the papacy rather than against it, he might have been an influential reformer within the Church, but instead, from the very start, he was adversarial and inflammatory. Calvin was eight years old in 1517 and didn’t do anything “independently.” A case could be made for Zwingli’s independence, but he made no attack upon the Church until after Luther launched the first volleys. In a situation that called for prudence and patience, Luther instead lit the powder keg. As we’ve discussed before, Luther’s early teachings — and even some of his later ones — could have been reconciled with Catholic doctrine. As you point out above, many Lutheran complaints were against abuses and not against the heart of the Christian faith. Reform didn’t have to lead to a disintegration of Christian unity. When Luther’s theses and letter were sent to the Archbishop, the Archbishop’s reply was to order Luther silenced. That order was never carried out, but from the beginning, when the theses were nothing more than academic debate topics, the hierarchy did not take them seriously. I don’t hold up Wycliffe or Hus as examples of the way reform should happen, merely as people who tried reform in the past. I disagree that Luther working with the papacy could have enacted reform (though, as the scenario never played out, one cannot know what result may have come). Even the Western Schism, an event as traumatic as the Reformation, was not catalyst enough for the Church to reform itself. The Council ended the papal schism, but could not end the abuses in the Church because the very people that make up the Councils (including the Pope) benefitted from those abuses and had no interest in correcting them. I still argue that, if not Luther, someone would have had to be the one to try and enact reforms. The closest person at the time who, while calling for reform, stayed on the good side of Rome, was Erasmus, and his ideas did not enact any change. Constance brought the papacy back from Avignon. That alone was a great leap forward. Reform doesn’t happen overnight. The Catholic Church is a slow and lumbering giant and change is difficult and painful. And generally, that’s a good thing. One doesn’t want a Church that’s swayed by whatever the prevailing cultural wind is.